NPCIL Recruitment 2018 - Apply Online for 59 Steno, Assistant, Nurse & Other Posts in NPCIL, Gujarat. Online Applications are invited by Nuclear Power Corporation of India Ltd. (NPCIL) from 25 Sep 2018 at 10:00 AM to 20 Oct 2018 til 04:00 PM for 59 vacancies. i. HSC (10+2) (Science with Chemistry) or equivalent with minimum 50% of marks + valid heavy Vehicle Driving License. ii. One year experience in driving heavy vehicle plus Certificate course in Fire Fighting equipment such as Fire Extinguisher etc from the State Fire Training Centers. Diploma in Nursing & Midwifery (3 years course) (OR) B.Sc (Nursing) (OR) Nursing ‘A’ Certificate with 3 years experience in Hospital (OR) Nursing Assistant Class-III & above from the Armed Forces. HSC (10+2) in Science with minimum 60% plus One year medical Radiography/X-Ray Technique Trade Certificate. HSC (10+2) in Science with minimum 60% marks plus 2 years Diploma in Dental Technician(Hygienist) recognized by Dental Council of India. A speed of 80 wpm in English Stenography, A speed of 40 wpm in English typing on PC. Candidates should have passed a certificate course of duration of not less than 6 months on MS Windows Operating System and Desktop applications such as MS Office (Word, Excel, Access, Power point) email management and internet surfing. Bachelor’s degree in Science or Commerce or Arts with minimum 50% marks. A speed of 30 wpm in English typing on PC. Eligible candidates may apply online at NPCIL's website (direct link is given below) from 25 Sep 2018 10:00 AM to 20 Oct 2018 04:00 PM. Candidates log on to https://npcilcareers.co.in/MainSite/DefaultInfo.aspx?info=Oppurtunities. NPCIL Recruitment 2019 - Apply Online for 200 Executive Trainees Posts in NPCIL, Mumbai, Maharashtra. 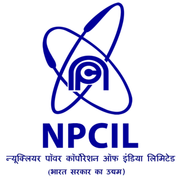 Online Applications are invited by Nuclear Power Corporation of India Ltd. (NPCIL) from 09 Apr 2019 at 10:00 AM to 23 Apr 2019 till 04:30 PM for 200 vacancies.